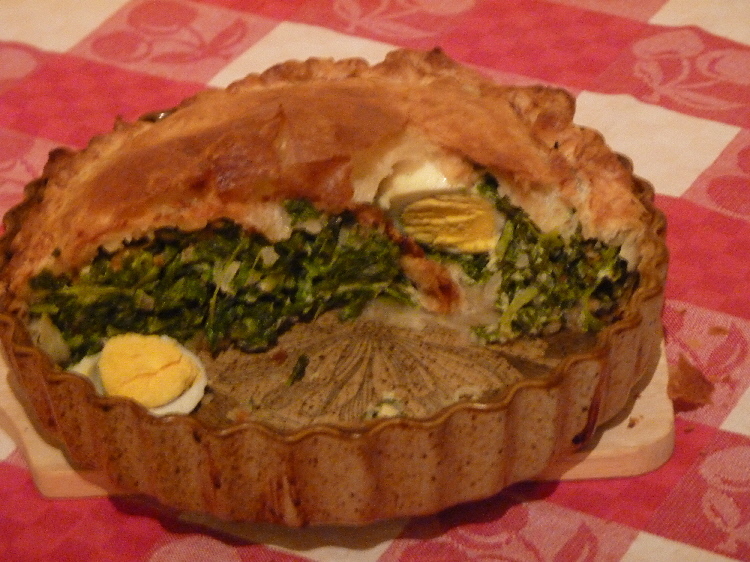 This traditional Easter recipe is courtesy of a friend in Northern Portugal. Filo pastry (18 circles). I used 2 x 230g packets of *PÂte Feuilletée which I think is ready-made filo pastry. *When I opened the packet of pastry I was disappointed to discover there was only one sheet, instead of the several I’d expected. Maybe I bought puff pastry instead! Cook spinach until soft and drain well. Beat 2 eggs in a bowl with a little milk. Add the grated Parmesan, cooked spinach and sauted onions. Add half of the *filo pastry to the bottom of tart dish making sure it come up the sides. Pour in half the spinach mixture. Place the hard-boiled eggs whole in a circle and cover with the remaining spinach. Add remaining *filo pastry, folding the edges in towards the middle. If anyone knows the history behind this recipe and why it’s considered a traditional Easter dish, I’d love to know more! Unfortunately, I found this tart a little bland for my taste. What extra ingredients would you add to give it more zing! I have listed further recipes on my Portuguese recipes page. Think yourself lucky you can buy pastry be it filo puff or whatever! That pie looks delicious. Maybe some bacon (for non veggies) or a bit of nutmeg or garliic would spice it up a bit. Here in the DR the traditional aEaster dish is beans cooked in carnation milk – lucky to have a bland pie methinks, but give me a nice big chocolate Easter egg any day. I should count my blessings re. pastry. I do usually make my own, but I did bulk at the idea of making 18 sheets of filo. It was nice, but something was def lacking. Bacon sounds a good idea as does nutmeg and garlic. Beans cooked in carnation milk sounds diffferent. Are you going to post the recipe? Please don’t start me off on Easter eggs, I’ve resumed my diet and regime. Can you get Easter eggs in DR? Hi Jake, sorry a little late with the challenge I see we are already onto light! i would like to try making this….everybody at my home absolutely loves new dish provided its only vegetarian.thanx kor the recipe!! Please let me know how you get on. What herbs or spices would you add to give it more zing? I think I would add shallots, garlic, bacon and some red pepper flakes. 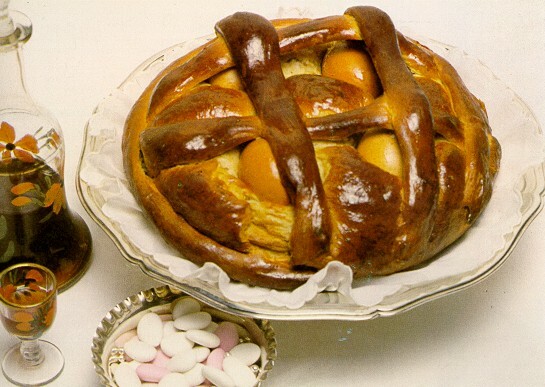 I had never heard of this tart before, but there is a tart (more bread like, but neither savoury nor sweet) that takes hard boiled eggs with their skin on as decoration on the exterior, it´s called “Folar da Páscoa” or Easter Cross Bread, that is traditionally served at Easter in Portugal and all the bakeries and patisseries would sell them. https://pigletinportugal.com/2011/04/16/folar-da-pascoa-traditional-portuguese-easter-bread/ and one of my subscribers kindly cooked one, photographed it and sent me the recipe of his version and photograph! The tarte recipe was emailed by another subscriber at the same time, so I thought I would post it as my Easter recipe for this year. What other traditional Easter recipes do can I try? what are your favourites? I make a delicious crustless spinach and cheese flan, using 50g crumbed feta, 250g cottage cheese, 50g grated cheddar cheese, 1/2 grated onion, plus a pinch a nutmeg, perhaps these ingredients will make your tart less bland – worth a try! Like you I am an avid gardener – I have over 200 pots on my terrace, yes it is BIG. I am also trying to grow veg, some more successful than others. As you mentioned in one of your blogs, perhaps it’s the soil. I am now using only the expensive bags of compost, we will see if the results are better, will let you know. I grow from seed, don’t like the look of the seedlings at the market. If you are ever in Portimao and would like to see my garden I would love to show it to you. the extra cheeses sound good…and the adition of nutmeg sems quite popular. 200pot! holy moley! I hope you have them on a watering sytstem! I’ve sent you an email. I was going to suggest nutmeg, but I see that someone beat me to it. I’ve seen some spinach recipes with ricotta cheese. Maybe you could try that. And of course, I second the bacon idea! Never heard of that tart and quite honestly it’s totally non traditional portuguese (only vegetables and filo pastry??). I think it’s a particular family tradition not a regional one. I’m looking forward to sharing this recipe with my mom. I bet she’s familiar with something resembling this. 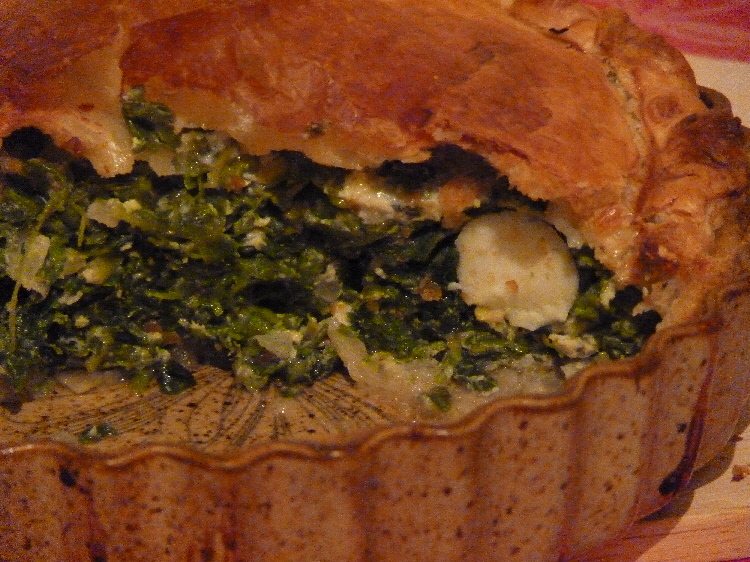 Sounds similar to spanakopita ~ Greek spinach pie with FETA. I expect that the eggs symbolize rebirth. that’s it Nancy! rebirth. that’s why they were whole as in the folar. Great recipe and I´m also going with nutmeg, bacon and garlic! 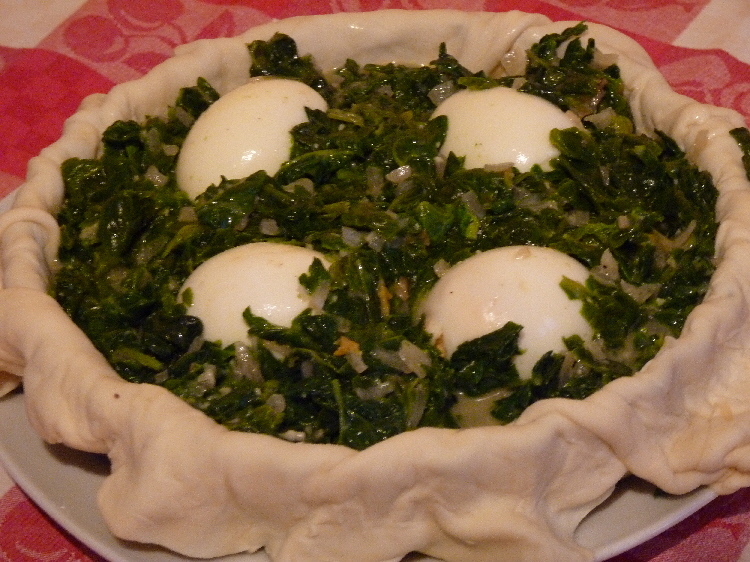 We have chard growing and plenty of our own eggs, so although I´ll have to adapt a little, I´ll be giving this a go soon. Yes, it looks like you bought puff pastry – it takes a while to work out all the different names on the packs! I used my own spinach hence my keeness to try the recipe. I think it was puff pastry but it tasted OK 🙂 I’ve still not learnt the difference 😦 between the various pastries. I usually make my own.. I’d be certainly interested to see how your tart turns out. It’s interesting to experiment with new recipes. We’ve just eaten the gammon we bought from Iceland last week, but the next one we are going to try curing our own from the recipe you posted on your blog. We can let each other know how the recipes went! I was going to ask what part of northern Portugal is your friend from as this recipe doesn’t look like any traditional Portuguese recipe I’ve heard of. I agree with Fernanda. I’ve just looked at the email again, and it was the local farmers wife who shared the recipe with her. She makes it for her family. Pip, this looks delicious. Anything with crust, eggs and veggies suits me, bland or no. Thank you so very much for checking on my post and remodeling project. The demands of my family have been huge for the past several months. My mother died a month ago after months of pain and struggle. My relationship with her was very difficult, so the going has been rough. I am just now beginning to feel more like myself, so hope to be able to begin posting again soon. That’s why I’ve “disappeared” from the web! And, I haven’t done any work at all on my new property for a few months. It’s been impossible. Currently, my entire kitchen is torn out of the home I’m in now, as I’m getting ready to install all new stuff so I can get my house on the market and sell it. 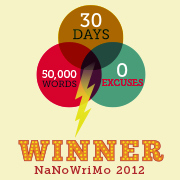 I will be slowly tuning back in to your wonderful blogs and look forward to exchanges with you soon. I hope all is well with you and your two new grandbabies and other family members! As you know I sent you an email. So sorry to hear your sad news and look forward to reading more about your project in the future. The ingredients remind me of my Quiche Lorraine, except the eggs aren’t boiled and I add a cup of cream. I concur with the comments suggesting nutmeg. I always add it to spinach dishes. It adds a little ‘hmm’ to the background. Your dish looks lovely. I like the way the pastry puffed up and will try this. I checked out tamarind (i’ve never heard of it) and I think I will need to buy the paste from an International supermarket. IT’s on my list next time we go shopping :)Thank you! I don’t see anything close to that in the recipe. It looks wonderful. Is it anything like a spinach quiche? Hi Judy and welcome 🙂 It is similar to quiche except you do not make an egg/milk mixture and there is FAR more spinach. Piglet, i’m so sorry. I am from the north of the country and i never see, or heard about that pie. For me sounds like heresy. And to prove, tradicional portuguese recipes, don’t use parmesan… 😦 i’m sorry to dissapoint you. Hi Samuel, do you have a traditional easter recipe you could share and I could try please?